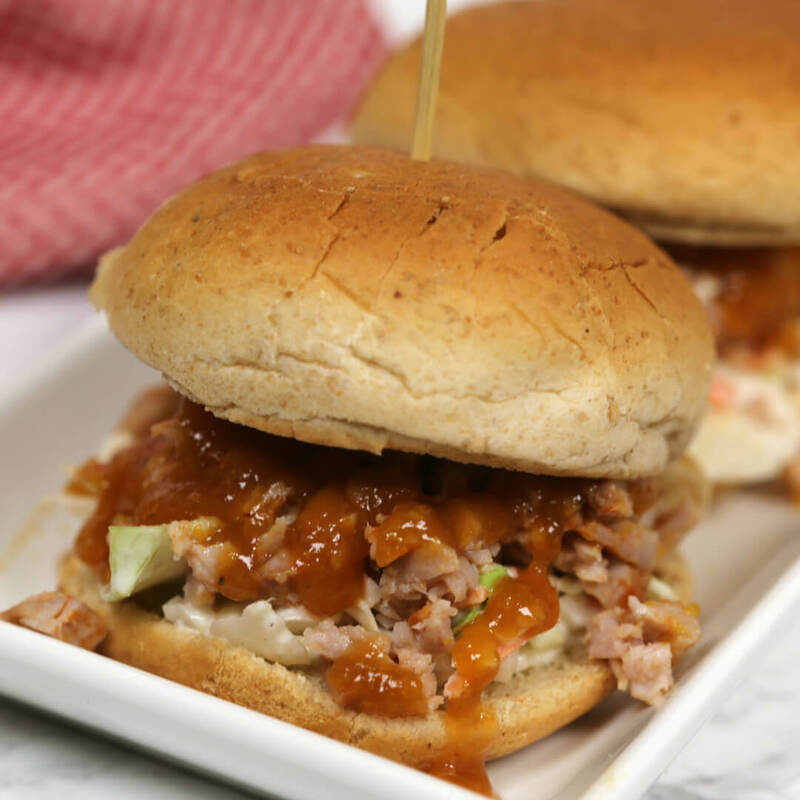 These Chipotle Pork Tenderloin Sliders are an easy sandwich recipe that is topped with chipotle slaw and a luscious peach bbq sauce. They will have you drooling. This post contains sponsored links from Hatfield. All opinions are 100% my own. I just love sliders! I don’t know if it’s because of their miniature size or the fact that I can eat more than one and not feel like I’m gorging myself. Either way, if I see sliders on a menu, I’m all over it. These Chipotle Pork Tenderloin Sliders are no exception. 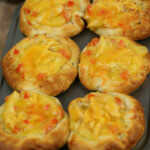 They are jam packed with flavor and texture. It’s a wonder I was able to fit so much deliciousness under that tiny little bun. 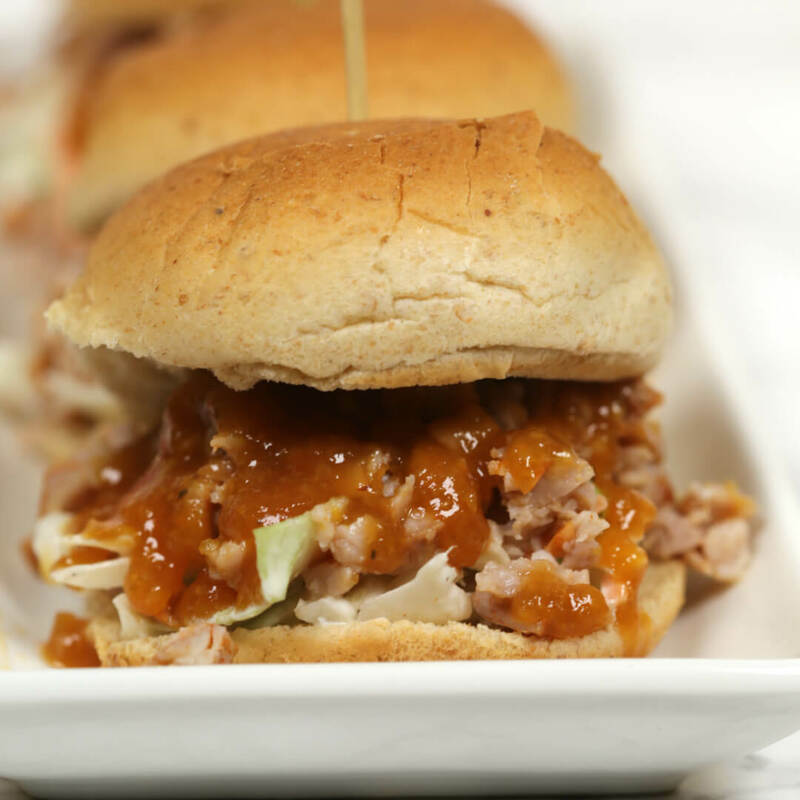 These sliders start with Hatfield Honey Chipotle Pork Tenderloin. 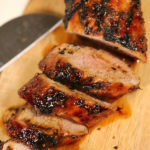 Hatfield took their premium pork tenderloin and dry rubbed it with a chipotle rub then marinated it in a sweet honey marinade. I prepared the tenderloin according to the package directions. I think it would also be great done in the slow cooker. The tenderloin came out perfectly juicy and bursting with flavor. I couldn’t help snacking on some while I was photographing the sliders. It’s an occupational hazard in my line of work. To assemble the sliders, I piled a healthy amount of Chipotle Slaw (recipe below) on the bottom half of the bun. Then I piled the pork on top. I chopped it finely but that was purely personal preference. You could easily leave it in slices. If you cook the pork in a slow cooker, you could easily shred it. 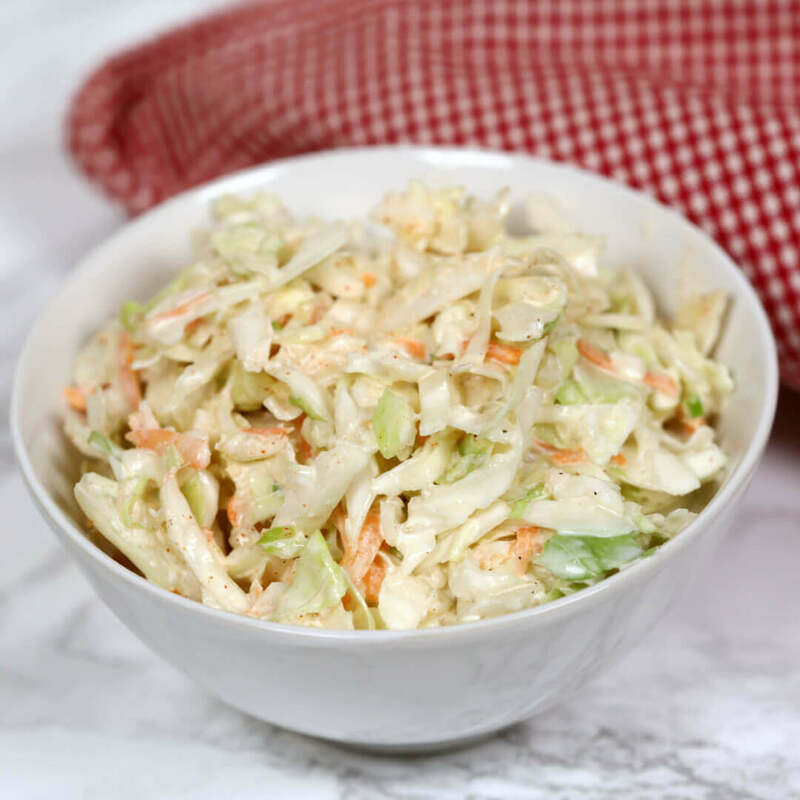 Whichever way you choose to prepare it, take the finished product and put a big ‘ol heap on top of the slaw. 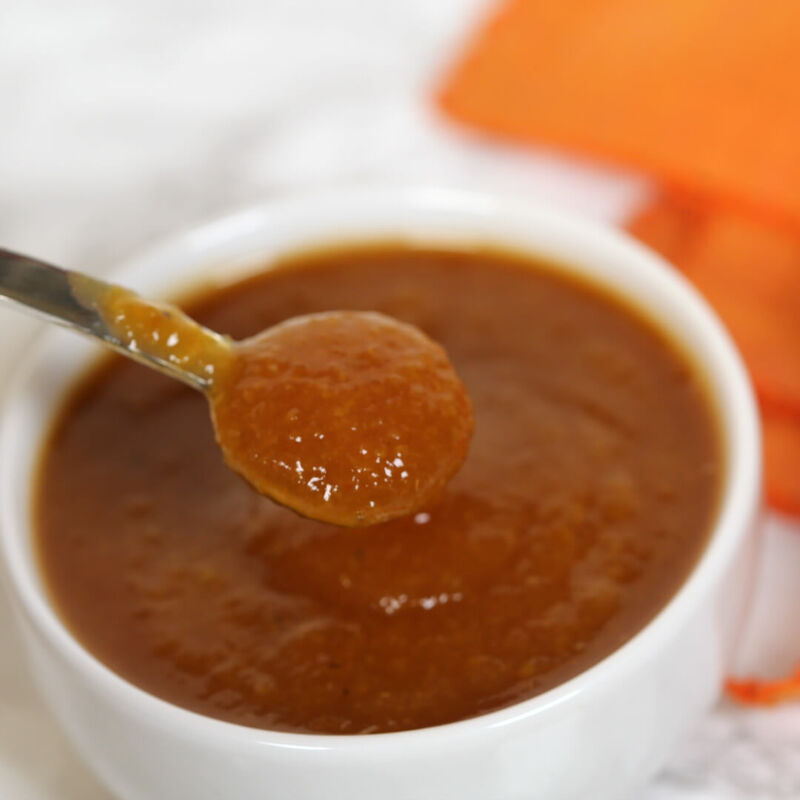 Then…and this is the best part…drizzle the Peach BBQ Sauce on top. OK, I’ll be honest. I didn’t drizzle it. Drizzling is way too dainty for these sliders. I slathered a generous helping on top of the pork. These sliders can handle it. Trust me on this one. The last step is to put the top bun on and try to refrain from smooshing the entire slider into your mouth at one time. These sandwiches are the perfect balance of flavor and texture. 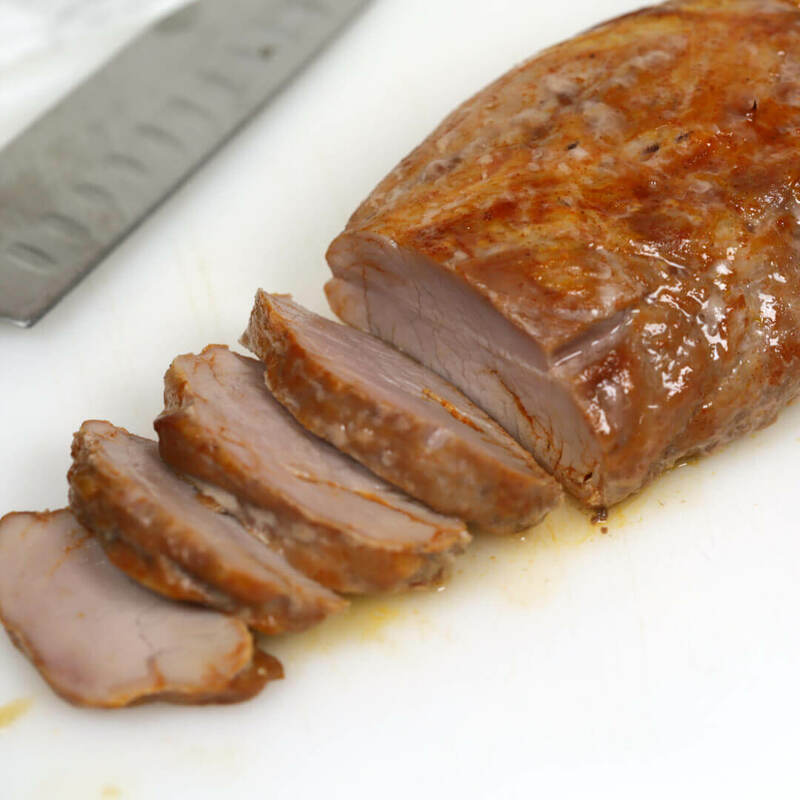 You have the cool, crisp, creamy Chipotle Slaw topped with the sweet and spicy Honey Chipotle Pork Tenderloin. Then you have the sauce. Ah, the thick sweet, smoky Peach BBQ Sauce oozing down into the slider. Becoming one with the meat and slaw. This, my friends, is sandwich nirvana. And, my family couldn’t get enough of them. Oh, I almost forgot…my son didn’t want his as a slider (what???). Instead, he had me make into a taco. That kid is a genius! I layered all of the ingredients into a soft flour tortilla and drizzled (slathered) the sauce on top. And, guess what? Taco nirvana! You really can’t go wrong. I’m loving these seasoned pork tenderloins from Hatfield. They have so many flavors to choose from. I can’t wait to try the Korean BBQ and the Italian Herb varieties. 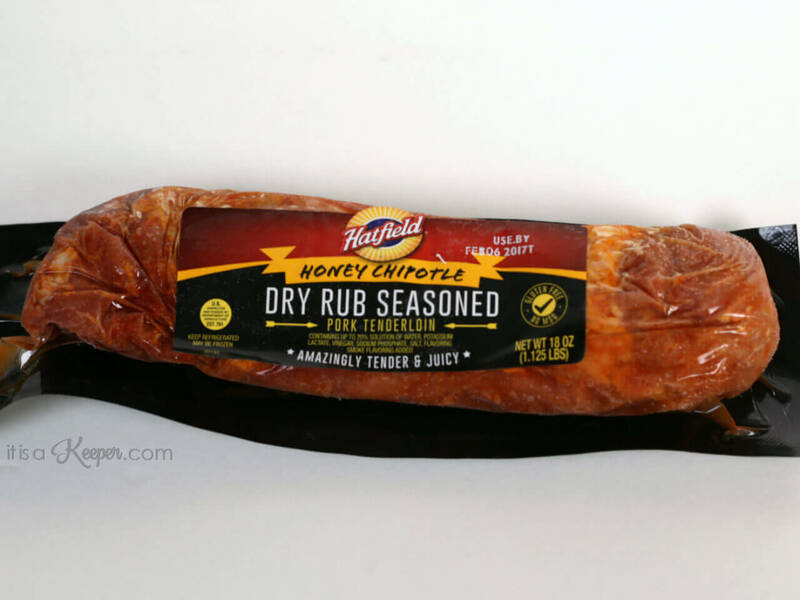 Hatfield is known for their premium quality meats that you can trust. It’s an American owned company that is headquartered not too far from where I live. It’s a family owned company that is centered around providing top quality meats to make meal times easier. That’s a mission that I can stand behind. Hatfield products are definitely keepers in my book. 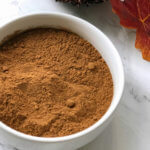 Make sure you check out their products and recipes for more inspiration and easy dinner ideas. Looking for more? 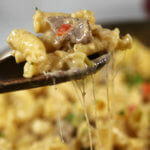 Check out all of the quick and easy recipes on It Is a Keeper. 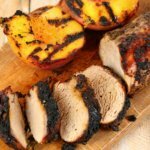 These Chipotle Pork Tenderloin Sliders are an easy sandwich recipe is topped with chipotle slaw and a luscious peach bbq sauce. 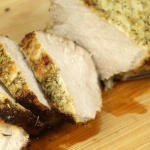 Line a baking dish with foil; place pork tenderloin in baking dish and cover with foil. Remove foil and bake for 5-10 minutes more or until internal temperature reaches 160 degrees. Remove from oven and allow to rest for 5 minutes. Finely chop pork; set aside. Remove top of slider rolls. Place a heaping spoonful of Chipotle Slaw on top of bottom bun. Top with a heaping spoonful of chopped pork. Drizzle a generous amount of Peach BBQ Sauce on top of the pork. Place the top of the bun on top of the slider. Enjoy! 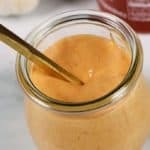 In a large bowl, whisk together the mayonnaise, sour cream, chipotle powder, and mustard, lemon juice, vinegar, sugar and salt. Add the prepared coleslaw vegetables; mix well.